The driver suffered minor injuries in the collision. 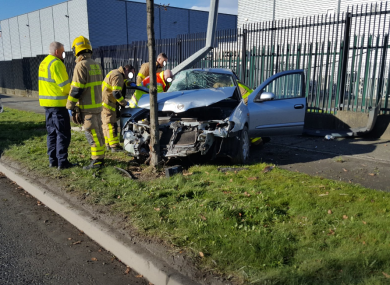 A MAN IN Dublin has been taken to hospital after he was involved in a single-vehicle collision earlier today. The incident happened near the Millenium Business Park in Finglas, north Dublin, and came after the man failed to stop for gardaí. Posting on Twitter, gardaí said the driver – who was not wearing a seatbelt – suffered minor injuries in the crash, and that investigations into the incident are ongoing. A garda spokesman told TheJournal.ie that the man was taken to hospital, and that he will be questioned by investigators at a later date. Email “Man hospitalised following single-vehicle crash after failing to stop car for gardaí”. Feedback on “Man hospitalised following single-vehicle crash after failing to stop car for gardaí”.